Welcome to the May 2017, edition of the Hillsborough Street Renewal, a monthly e-newsletter keeping businesses and residents along the corridor up to date on Phase II construction news. 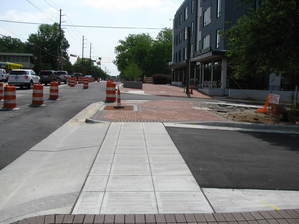 This spring, we have seen the hardscaping along the south side of Hillsborough Street start to take shape. 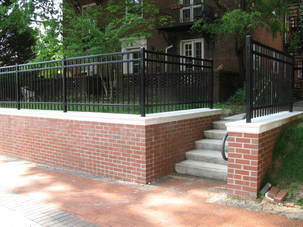 Reader’s Corner has a new parking lot, a retaining wall with stairs and handrails was built at Fincastle Apartments (3107 Hillsborough Street), and the trolley rails were installed on the rain garden at the 2811 Building. The brick and concrete sidewalks, with either Capital Grid pattern or brick banding, along the south side are also just about complete. The Friendly Drive and the Brooks Avenue and Founders Drive intersections are the only sidewalks still needing to be completed along the south side. Brooks Avenue could not be completed until school was out, due to the high level of student traffic in that area, and Friendly Drive is behind schedule due to complications that private utility companies encountered at that intersection. Both sections are the primary focus for crews in the coming weeks and look to be completed by early June. Many people may be wondering; what is happening on Daisy Street? 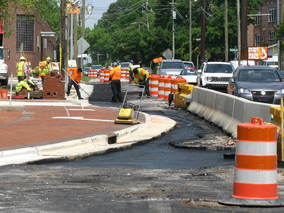 The concrete barricades in the center lane in front of Daisy Street were put in place to allow the contractor to install the new sewer main and the new water main that crosses Hillsborough Street and runs up Daisy Street. Pipeline Utilities ran into leaking water valves while working in this location. The leaking water valves, combined with the petroleum-contaminated soil in that area, caused the work to come to a halt. Pipeline Utilities has been working with the City’s Public Utility Department on solutions to this issue. Currently, the contractor is working out of sequence and installing the new water services to businesses connected to the section of existing water main causing the problems. The work is taking place during the overnight hours to minimize any disturbance to businesses affected. Once these services are completed, the crew will be able to shut off the water main with the leaking valves and complete the work at Daisy Street. There is new temporary pavement installed along south side of the corridor. The new pavement is in preparation for construction activity to switch to the north side early this summer. With the new pavement in place and the concrete barricades removed, the contractors were able to shift the middle-lane barricades at Daisy Street slightly west to accommodate the installation of a sanitary sewer main from Daisy Street to Concord Street. This week construction activity is focused at the intersection of Brooks Avenue and Founders Drive. Crews have started the hardscaping on the south side of the intersection, including parts of Founders Drive. In the next three weeks, you will see the new curb and gutter and other hardscaping work completed at this intersection. While this work is being completed Founders Drive and the south side of Hillsborough Street’s entrance to Brooks Avenue will be closed to through traffic. Starting Saturday, May 20, through May 29, there will be no traffic allowed at this location. Crews removed the tree battens from the south side of Hillsborough Street and most of the concrete barricades as well. This work is in preparation for the next phase of the project to begin on the north side next month. 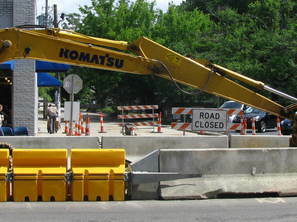 Most of the businesses are located on the north side of the corridor, and while they have been affected by the construction activity, the amount of work along the north side will significantly increase during the next project phase.” Businesses need to be prepared for the upcoming construction activity associated with the north side. Sidewalks will be diverted, and driveways will have minimal access at times during the coming months. Crews will be installing new underground electrical and cable duct banks, new storm drains, some new sanitary sewer lines and the hardscaping. The activity in front of businesses will be intermittent, as the contractors are not able to complete all tasks in front of each business at once. There will be construction barrels and even large equipment in front of businesses at times, driveways and parking lots will have disturbances causing the entrances to be constrained. 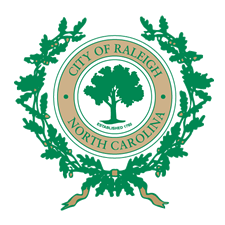 On Tuesday, June 13, at 10 a.m. the City will have a project progress meeting (Coffee Talk) at the Stanhope Building (3001 Hillsborough Street). At this meeting, Richard Dickie, the project manager will address the construction activity along the north side. He will be on hand to go over what each business can expect during the coming months. The meeting is also an excellent opportunity to network with other businesses along the corridor, and develop ideas to help each other out during the coming months.